Driving Lights ~ $20 + 'Pilot' harness and switch ~ $25 = $45. 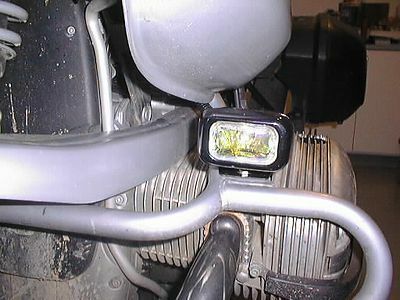 Mounted on Wonderlich Crsh Bars, BMW1150GS. I use these lights 'on all time' as conspicuity lights. At night, they are helpful as they widen and lengthen my normal low beam pattern somewhat. Replacement bulbs cost $6-$7.